Historic Baker Mansion was built in 1849 and well known as a real haunted mansion in Central PA. It's now the home of the Blair County Historic Society! The 28-room mansion was built by Ironmaster Elias Baker for his family. The Bakers occupied this beautiful mansion until 1914 when Elias daughter, Anna, died. It is well known through the community that the Baker family is who is haunting Baker Mansion. Although there have been eye witness reports by many people working in and near the mansion, along with visitors simply taking tours through the mansion, have reported seeing ghostly images in various rooms that had no connection to the Baker family. The latest ghostly tale I receive about Baker's Mansion was from a mother of a 2 year old boy. They were taking the Halloween tour and the boy wouldn't go to the basement because he didn't want to walk past the scary soldier at the bottom of the steps that kept staring up at him. Nobody else saw this soldier, but we all know that children can see and hear spirits so much easier than adults. You can read this testimony if you click on the button to the left marked "Your Ghostly Tales". Scroll down and read lots of ghostly testimonies submitted by visitors to this website. Follow this link and read the interesting history of Baker Mansion and see the unique interior design and layout of the rooms. One of the most famous attractions at Baker Mansion is the wedding dress pictured above. I was originally told by, what I thought to be a very reliable source, that this wedding dress was to be Anna Baker's wedding dress, but her father Elias forbid her to marry the man she was engaged to. He was an extremely dominating man and Anna never forgave him nor never married. She packed her dress away and it's now on display in a glass case on the second floor of the haunted mansion. But I recently have been contacted by Jeannine L. Treese, Executive Director of the Blair County Historical Society and Baker Mansion, to correct the story behind the wedding dress. 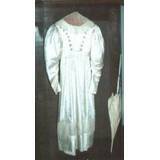 The wedding dress actually was worn by Elizabeth Bell in 1830, who was the daughter of Edward Bell, another early Blair County iron master. The wedding dress is on display in the Bell Room, which memorializes the Ball family. The community of Bellwood, PA, is named after Edward Bell. Many visitors to Baker Mansion and people that work for the Blair County Historic Society have witnessed the weird happenings revolving around the famous wedding dress. Regardless of who the wedding dress belonged to the weird accounts leave employees and visitors with no doubt that Baker's Mansion is without a doubt a real haunted mansion. Documented accounts by the Blair Country Historic Society have recorded eyewitness testimonies of odd occurrences involving sighting of Elizabeth Dysart's wedding dress shaking violently and rocking back and forth in the glass case. There have even been times when the shaking was so violent the Historic Society was worried of the glass case shattering and ruining the dress. What makes this account even stranger are that these occurrences seem to happen on nights of the full moon, and on Halloween. Elizabeth Bell's wedding dress is no longer on permanent display due to deterioration caused by exposure to light and air borne pollutnants. Baker Mansion has always reminded me of an old Southern Plantation seen in the old movies of the Civil War. I've grown up in Central Pennsylvania and have heard all the legends and rumors of this real haunted mansion. I went to Baker Mansion one beautiful fall day to pick up the snow globe I had ordered. While there I decided to stroll through the rooms and get some pictures of the beautiful mansion and antique furniture. I had no idea I was getting pictures of ghostly orbs and a strange ghostly figure in one corner of the living room. The picture to the right is the original desk used by Elias Baker. It's located in the library, along with his wrought iron swivel chair, and double-lock safe. There is also a large bookcase that holds many of Elias books from that era. It's hard to see the ghostly orbs that showed up on my digital pictures on Elias desk. So I cropped a closer look at one of the ghostly orbs that was sitting on the left side of the desk. I found another ghostly orb on the wood trim on the window of this real haunted mansion. Nothing fascinated me more than seeing a ghostly figure in the mirror. At first I thought it was the sheer curtain under the heavy drape until I looked at other pictures of the same corner that I took but not in the mirror. The drapes were straight and neatly hanging, there was no sheer curtain overlapping. You'll have to look closely in the picture to see the reflection of a ghost. Look in the mirror into the corner beside the window you'll see a very faint ghostly figure on the corner of the drape. There's a glass dome sitting in front of it. It's a real Pennsylvania ghost that lives in this famous real haunted mansion! Another picture that shocked me was the one I took in the Double Parlor of the real haunted mansion. 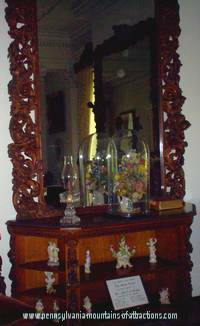 Here I found another mirror above a beautiful wooden furniture Elias had imported from Belgium. Look closely at the reflection in the mirror. It's actually a reflection of a mirror in the mirror. I really wasn't trying to play trick photography, but I think it's pretty cool the way it turned out. If you look at the reflection in the second mirror you can plainly see two ghostly orbs. Visitors to the haunted museum have seen both Elias and Anna in the house. Many witnesses have testified to seeing a dark figure on the staircase leading to the second floor. Anna has been seen in the parlor and the bedrooms on the second floor. If you're not sure what a ghostly orb is, visit the page I wrote about the ghost hunt at The Altoona Railroad Museum , there I go in to more detail exactly what a ghostly orb is. Visit the mysterious and historic haunted Pennsylvania. 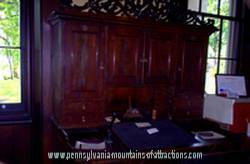 You never know when a Pennsylvania ghost will want to appear and disappear, one thing you'll know for sure, you'll love the entertainment. NOTICE! : Pennsylvania Mountains of Attractions is not responsible for any opinions or stories contributed in this section. The stories are posted for entertainment purposes only. Pennsylvania Mountains of Attractions reminds viewers that not all posts are accurate and that many of the sites in this section are privately owned. The views expressed here do not necessarily represent those of Pennsylvania Mountains of Attraction. Pennsylvania Mountains of Attractions reminds the readers that it is illegal to trespass on private properties.